Government of Pakistan, Finance Division (Regulation Wing) Notification No. F.5(2)-Reg.6/2015-1210 dated 09-02-2016. 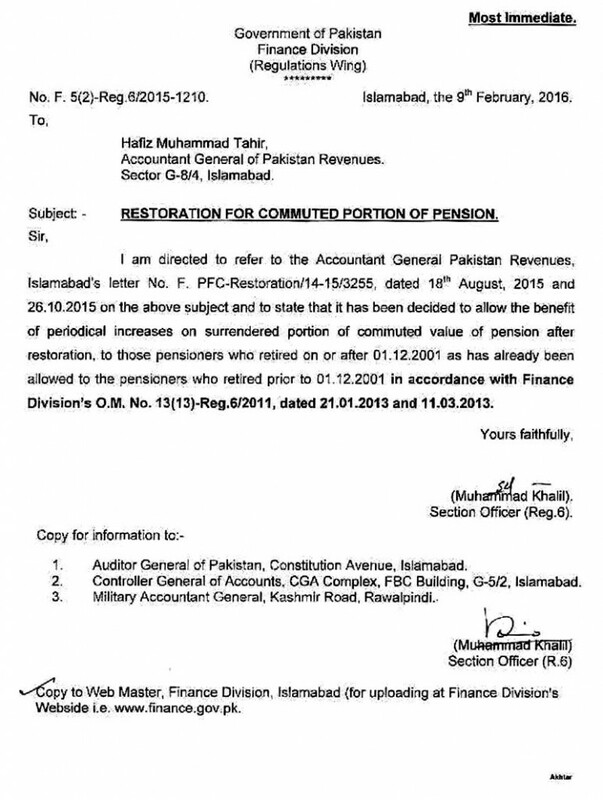 According to this Notification / letter, I am directed to refer to the Accountant General Pakistan Revenues Islamabad letter dated 18th August 2015 and 26th Oct 2015 on the subject and to state that it has been decided to allow the benefit of periodical increases on surrendered portion of commuted portion of pension after restoration, to those pensioners who retired on or after 01-12-2001 in accordance with Finance Division’s Notification No. 13(13)-Reg.6/2011 dated 21-01-2013 and 11-03-2013.